I posted this a few years ago, but it is still just as relevant today. Do you really know St. Nick? Everyone loves jolly ol’ Saint Nicholas. There is something romantic and cozy about telling Santa stories around the crackling fire. He is an icon of the Christmas season. But not everyone agrees about the real Santa Claus. Some like to picture Santa as the early-19th century, pipe-smoking elf with a bucket full of coal for naughty boys who don’t eat their cauliflower. Others prefer Santa as an emasculated, overweight consumer who gets bossed around by Mrs. Claus and thus flees the North Pole once a year to relive the glory days. 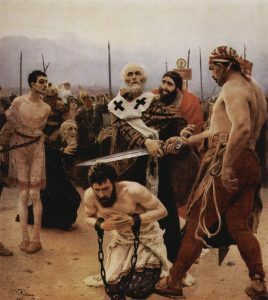 Then there is the wiry bishop who pulled Arius’ beard and punched him in the face for teaching heresy. Maybe they’re all the same guy. A 1,700-year-old hero can’t be expected to fit into just one old Santa suit. 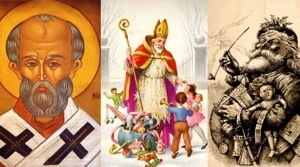 Our images of St. Nicholas seem to evolve or deteriorate based on the values of contemporary culture in different times and places. For the whole article written by Christopher Warner in the free on-line magazine Catholic World Report click HERE.